I was craving for Thai food after blogging about my trip to Bangkok. Since folks kept telling me that Jai Thai serves cheap and good Thai food, I decided to make a trip there for lunch. Jai Thai Restaurant has three outlets at East Coast Road, Clover Way, and the other at Purvis Street where we went to. The menu is broad in categories: appetisers, curry, tom yum, seafood, beef, chicken, vegetable, rice and noodle; and deep in choices, with plenty of dishes to choose from under each category. With the exception of steamed fish which cost slightly more, most of the items on the menu are priced between $5-8 for small portion. It is my new favourite Thai Restaurant to go for a quick and inexpensive meal. We knew what we wanted, which was a good thing because there are so many things on the menu. Between the two of us, we shared four dishes and two Thai milk tea. The food came quickly and we started with the Phad Thai, the dish that is synonymous with Thailand. I really liked Jai Thai’s Phad Thai ($5 for small); the noodles had a nice wok-hei and the right level of moistness. With a squeeze of lime, it was textbook perfect. The other dishes that we had were decent, nothing to write home about. 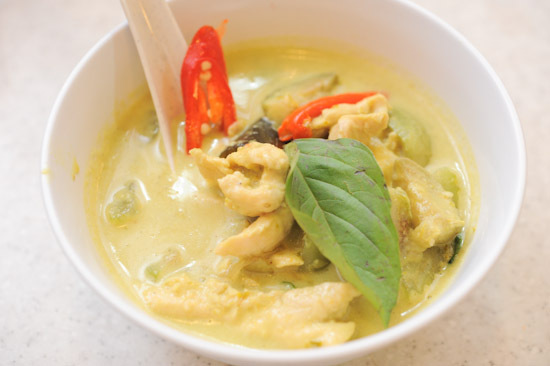 Take for instance, the Green Curry Chicken ($5 for small). It was certainly satisfying, but nothing special to make me sit up and take notice. Tom Yum Seafood Soup ($5 for small), while tasty – would be perfect if it was hotter. I know, I know. I’m asking for it. But for something like Tom Yum, it’s either all or nothing. A simple and honest meal. Jai Thai serves very decent Thai Food at affordable prices. I’m adding it to my list of Best Thai Restaurants in Singapore, definitely going back soon. Hello, happy new year!! Here’s to more eating adventures! Haha i’m going to bali on wednesday with a few tips from your website! I love Thai food. I actually travel to Bangkok over the weekend just to eat authentic Thai food… in authentic settings… aka motorcycle/car fumes and bustling street life. Jai Thai is fine. Affordable. But not exactly the best tasting. I find the most authentic at Golden Mile Complex. But I go there only if it’s quiet on weekdays… cos weekends… it is akin to going to Bangkok’s bad areas with seedy vices and drunkards everywhere. Then again, it does add to the experience of eating. I have recently been going to Tawandang Singapore. It’s a major concept in Thailand… big beer halls and good music that matches so well with good food… especially the pork knuckles. But the concept hasn’t really been working well in Singapore as in Sg, we tend to seperate heavy drinking (house brew beers) and eating. 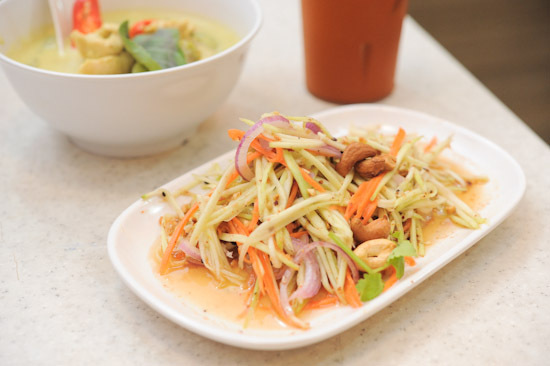 In Thailand, eating and drinking together on the same table is the norm. Eating is a celebration, not a chore and a rhythm. the jai thai outlet at clover way has mango glutinous rice which is TO DIE FOR check out that outlet next time!